ZESI prepared the drainage study for the reconstruction of Wallisville Road between Lockwood Dr. and IH 610. The proposed improvements will widen the current roadway from a 2-lane road to a 4-lane road with a center turn lane (a typical City of Houston 80-foot roadway). Existing and proposed storm drain systems were modeled in Houstorm. Proposed improvements included storm drain pipes that ranged from 24 to 72 inches. thick formed concrete with a double matt of reinforcement. Zarinkelk Engineering Services prepared the PER and final design for the Beverly Street Drainage Improvements. ZESI provided design services. This project consists of road side ditches and culverts on both sides of Beverly Street between Pine and Sycamore, a 36 to 48 inch diversion storm drain along Sycamore to the Jana Street detention pond, and improvements to the detention pond to accept the flow from Beverly Street. An early concept of the project had the Beverly Street road side ditches discharging at Spencer Highway on the southern end. However, concerns for the capacity of the Spencer storm drain drove the project in a different direction. The final concept was to intercept a portion of the flow on Beverly at its halfway point at Sycamore and divert it through a 36- and 48-inch storm sewer to an existing detention basin on Jana Street. The detention basin required reshaping of the basin bottom and modification of its outlet structure to accept the diverted flow from Beverly. This project included review of channel cross sections and HEC-2 model output to determine if the current bridge configurations will accommodate the proposed channel cross section. ZESI performed a site investigation to determine the condition of the 27 bridges from a structural standpoint and prepared a comprehensive bridge condition report. The report addressed flood mitigation, approach road transitions, traffic control issues, potential utility conflicts, and coordination and adjustment and/or replacement issues. It provided a conceptual cost estimate for each bridge analyzed. Suretrak scheduling software was used for the project. residences that are to remain after the buyout program has been completed. The Harris County Queenston Blvd. project involves design of 2,960 feet of 100-foot right-of-way concrete boulevard. The project includes the design of a storm sewer system, an SW3P, a storm water quality control plan, and a traffic control plan. The probable construction cost is $2 million. ZESI provided assistance for the federally sponsored White Oak Bayou 211(f) project. ZESI engineers provided modeling assistance, modeling QA/QC and assistance in preparing the General Reevaluation Report document. The project identified $165 million in needed improvements that include channel widening, detention facilities and structure relocation. Improvements were compared and selected based on net economic benefits. ZESI provided engineering services for the repair of the Brightwater Outfall structure. 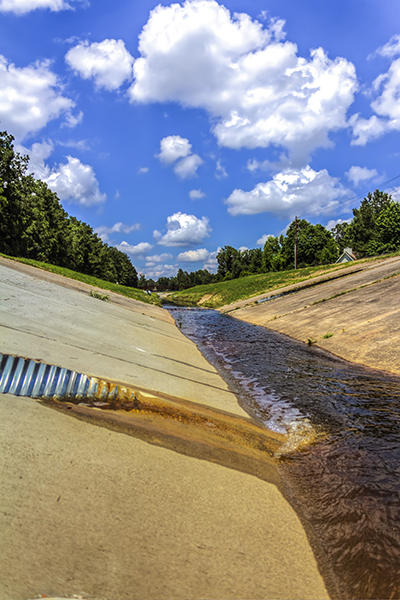 The Brightwater Outfall Structure is located on one of the tributaries to Oyster Creek in Missouri City, Texas, north of Highway 6 between Brightwater Point Estates and Lakeside Meadow at Brightwater. It provides an outlet for the lake to Oyster Creek under Lakefront Drive. Signs of seepage under and around the concrete surface on both sides of the downstream portion of the structure have been noted and erosion of the bedding can be anticipated if seepage is not corrected. Potential solutions include grouting the cracks within the structure, the installation of an impermeable barrier, and the removal and replacement of the structure.